Replaces your A2 front sight and provides 4 Picatinny rails. 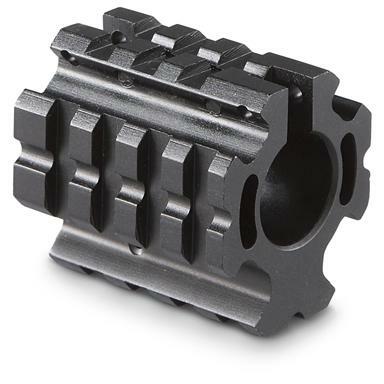 Top rail is lower than flat top by 0.28"
Sniper Low-Profile Quad Rail Gas Block is rated 4.2 out of 5 by 35. Rated 1 out of 5 by Dave from Does not work right I got this to convert from the "A" frame a-2 front site mount. I have not been able to get my AR to cycle the bolt since installing it. At first I thought it was not properly aligned but after disassembly and a lot of measuring and reinstallation I still have the same problem. I wanted the quad rail to mount the bipod on the bottom but it is of no use if it does not work right. I am going to order a different one and hope for better results. Rated 1 out of 5 by hackmeister from Piece of junk Don't bother wasting your time with this. I could not get my rifle to cycle properly with this gas block. As soon as I changed it out with a standard low profile gas block my cycling issues were solved. Rated 2 out of 5 by MSCustomGuns from Cheap Screws As another reviewer noted, the cap screws that come with this are very soft. They stripped out when I tried to take the block back of for painting. Ended up drilling one out and tossing the whole thing in the trash. It's a very clever concept, but very soft aluminum. If you're very careful with it, you may be OK. But be very careful. Rated 5 out of 5 by Angel from Fit perfect. Easy to install. Rated 5 out of 5 by L B 1 from The price was very reasonable. Rated 5 out of 5 by notrich from Just right I really like this gas block rail setup. Its not low profile to fit under handguard but it looks good and is a clamp on block. Not the set screw kind I don't trust to stay put. It works with the removable A2 front sight and carry handle well too.